WITH FOUR ILLUSTRATIONS BY DUDLEY HARDY, R.I.
OBVIOUSLY young Phipps should never have been admitted a member of the Mausoleum Club. He was the only member one could readily call to mind who had any hair whatever on the crown of his head, and the only human being who had ever committed the outrage of whistling (yes, whistling) on the staircase of that solemn institution. As a matter of fact, he passed the committee simply as the son of his father, the great Sir Mumplebury Phipps, the palaeographer. It would be a great blow to his father if young Phipps were expelled from the Mausoleum; but something of the sort is sure to happen sooner or later. He will be fortunate if he is only asked to resign. It might have been expected that the somnolent dignity of the place and the members would have had its effect on young Phipps; and so it did, but it was quite the wrong effect. It stung him into excesses of misbehaviour, such as he would probably never have contemplated in any less portentous environment. He was constantly exposed to the temptation to do something atrocious and see what would happen. Mind—I am not offering excuses for young Phipps; I am merely explaining. His worst outrage was never distinctly traced to him by the committee, but—! It was something so very shocking that I would rather not mention it; but that happens to be the only way of explaining what followed. I will just say, then, hurriedly and without painful detail, that early one evening he secreted gin in a flat bottle under his coat and entered the smoking-room at a moment when it was empty. Two freshly-filled water-carafes stood there, and these he took and partly emptied into a ventilating pipe; he then divided the contents of the gin-bottle between the two carafes and replaced them carefully where he had found them. That was all. Now, as it happened, this was the first evening for many years that Mr. Priscian Macfadyen had spent at the club; and the reason was that this was the first night for many years that Mrs. Macfadyen had been away from home without her husband. She had been sent for, in fact, by a sister who had been taken ill; and as she had not positively extracted a pledge from Mr. Macfadyen that he would stay at home, that dutiful husband thought there could be no positive objection to the exceedingly mild diversion of an evening at the Mausoleum, and no absolute need to report the fact to Mrs. Macfadyen on her return. It was a sad thing—a tragedy, as you will see—that on the occasion of Mr. Macfadyen's first evening at the club for years there should be gin in the water-bottle. In the smoking-room Mr. Macfadyen met his old friend Bowker, whom he had not seen for a very long time; because Bowker was a bachelor and spent every evening at the club. Bowker had very good cigars of his own, which he preferred to those kept on the premises. Mr. Bradley Jeeves, another old acquaintance, also liked Bowker's cigars. So these three elderly contemporaries sat together with three of Bowker's cigars between them; and, partly because they were of a generation before the coming into fashion of whisky, and partly because of certain restrictions of Mr. Bowker's doctor, they resolved on three glasses of weak brandy and water; especially as Jeeves had been told of an excellent new brandy just arrived in the club cellars. Three tumblers were brought, with a little brandy at the bottom of each, and one of the treacherous water-bottles was placed at hand. Mr. Jeeves, after a sniff and a slight sip of the undiluted brandy, added a generous helping from the water-bottle, and pronounced the result quite extraordinary. "This is really a brandy of very remarkable quality," he said, "with a character quite its own. Somehow the water seems to bring out the flavour." Bowker agreed, and resolved to speak to the secretary about getting some of that same brandy for his private store. And Mr. Priscian Macfadyen, with glowing interior and blinking eyes, approved of the cigar and the brandy, and Bowker, and Jeeves, and the circumstances generally—but particularly the brandy. "There's a certain curious silkiness—yes, I think silkiness is the only word—about this brandy," said Mr. Bowker, critically, "that is positively extraordinary." He took a good mouthful, and swallowed it with lingering approval. "Excellent!" he went on, "quite excellent! It's very far from being my usual habit, but it's very tempting, and I really think I must have another." So they had another, all three, and from a far corner the diabolical Phipps, entrenched behind a newspaper, watched the fell result of his revolting machinations. Let us, with a truly and genuinely respectable shudder, draw a veil over the rest of that evening's transactions; a veil thick enough to conceal the fact whether or not those three unoffending and most proper elderly gentlemen, under the stimulus of the first two, had another glass apiece, or even more. A veil that will permit no glimpse of the confused oscillations of three exceedingly pink scalps as viewed from the top of the Mausoleum staircase at their departure very late in the evening indeed. A veil that will reveal nothing of the panic amazement of the decorous hall-porter, nothing of the rumours of musical efforts in the fresh air of the street, nothing of suggested explanations before the committee. MR. BOWKER awoke very late next morning with a double-elephant headache and a very doubtful remembrance as to how he had acquired it. His man was gathering up his clothes, striding after them about the room in a subtly irritating manner which Mr. Bowker strongly resented. The fellow was under notice, and since he had received it his manner had grown less respectful each day. Mr. Bowker noticed that there was a good deal of mud on the clothes, and he began to wonder as to the manner of his home-coming. "I—I was rather late home last night." "This mornin', sir," corrected Wade. "But you didn't wait up after twelve, I suppose?" "No, sir." Mr. Bowker was vastly relieved till the man added, "But I got up to let you in, sir." "Not necessary," snapped Mr. Bowker—"not at all necessary." "Beggin' pardon, sir, I found it very necessary." A very insolent scoundrel, reflected Mr. Bowker, between the throbs of headache. But he would very much like to remember There was some talk of a new brandy at the club—he could recollect that perfectly; and Macfadyen was there. But beyond that everything was the blankest of possible blanks. The new brandy must have been uncommonly bad. What had happened? He must try Wade again. "I don't feel very well this morning, Wade," he remarked. "Indeed, sir? You surprise me, sir." "Why surprise you?" asked his master, testily. "You was very 'appy last night, sir—meanin' this mornin', of course. Very 'appy indeed. I never see a gentleman better nourished." Better nourished? This was sheer impudence. And yet—- Mr. Bowker was a bachelor, but no bishop, no archbishop, could be more respectable than Mr. Bowker. It would be well, perhaps, to bear with the fellow till he revealed a little more. "I took something that seriously disagreed with me last night, Wade," he said. "Very likely, sir, I should think. You wasn't thinkin' of a watch an' chain, sir, was you, or a gold ring?" "Watch and chain? Gold ring? What do you mean?" "Only these here, sir. They was in your overcoat-pocket with this purse. I 'aven't ever seen 'em before." And Wade, with a calmly deferential impudence, displayed before his master's eyes a wholly strange gold watch and chain, a signet-ring, and a purse. "In my overcoat-pocket?" gasped Mr. Bowker. "Yessir. They came tumblin' out when I brushed it." Mr. Bowker fell into a sweat of apprehension. What had he done? Where had he been? He must have robbed somebody! There was triumph in Wade's eye as he observed the obvious consternation of his master. He stood a picture of malicious satisfaction while Mr. Bowker, with trembling hands, snatched and opened the purse in search for some mark of identification. There were several sovereigns in it, and a half-sovereign, but no paper, no initial—nothing to give a hint of the rightful owner. It was a horrible situation. Many years ago, when Mr. Bowker was a young man, there had been occasions when he had found it difficult to recall the events of the previous evening. He had been active, high-spirited—less decorous than now; but his wildest escapade fell a world short of this. Never had he been confronted with anything like the ghastly difficulty that faced him now—the possession of a watch and chain, a ring, and a purse that were obviously the rightful property of some other person, and could only have been acquired dishonestly—perhaps by violence. He pulled himself together as well as his shattered condition permitted, and requested a weak brandy and soda. "Yes, sir," replied Wade; "nothing like an 'air o' the dawg that bit you." The impudent scoundrel was presuming on what he had seen and conjectured, and his master felt himself helpless. "By the way," he said, suddenly, on the impulse of a bright thought, "are you sure it was my overcoat, Wade?" "Oh, yes, sir. The coat's yours all right. You won't get into no trouble over the coat." The man was growing insufferable, and Mr. Bowker was positively afraid to resent it. "Ha, hum! That will do, Wade," he said, as loftily as possible. "I'll ring if I want you. I-ah—I shall attend to the matter of—ah—these things during the day. Meantime, of course, I shall expect you to say nothing about it to anybody." "No, sir—certainly not, sir," replied Wade, with an oily grimace that almost included a wink. He paused in the doorway and repeated, "Certainly not, sir. I sha'n't say a word—so long as I remain in your service, sir." Mr. Bowker groaned in spirit. The fellow was plainly threatening to give him away unless kept in his employ. But something must be done, and done quickly, to ascertain what had happened last night. The police might even be on the look-out for him at that very moment! He dressed and made his best attempt at breakfast. Then, with that shameful plunder again in his coat-pocket, he set out to call on Mr. Macfadyen, desperately striving as he went to recall some fragment of last night's adventures. But it was useless. He could remember nothing after the second trial of the curiously seductive new brandy. He might have gone anywhere and done anything. Mr. Macfadyen lived just where you would have expected to find a bald-headed fungologist of Erastian tendencies—in Bloomsbury, in the most respectably ordinary house of the most respectably ordinary square to be found in that parish. Yes, Mr. Macfadyen was at home, but engaged just at present, explained the man who opened the door, with some mystery. Would Mr. Bowker please step in? Mr. Bowker did so, and as the door closed behind him he was aware of skirts on the landing above the lower stair-flight. This was awkward. Mrs. Macfadyen must have returned sooner than was expected. "Mr. Bowker, is it you?" said the lady. "You've heard of our trouble, then—very kind of you to come. Won't you come up?" What "trouble" was this? Mr. Bowker had never for a moment anticipated an encounter with Mrs. Macfadyen, whom he held somewhat in awe, as did other of her husband's friends. It would certainly be out of the question to enter into any discussion of last night's proceedings in presence of Mrs. Macfadyen. As it was, he was supposed to be aware of some trouble which had fallen on the house of Macfadyen, and to be so kind as to call in consequence. Here was something to excuse his presence, if only he knew what it was. He soon learned. Mrs. Macfadyen led the way to a dressing-room where Mr. Macfadyen, looking vastly perturbed and extraordinarily uncomfortable, stood in consultation with a stranger. "Oh, good morning, Bowker," said Mr. Macfadyen, rather hurriedly. "We—we haven't seen much of you lately. Wondered what had become of you. We've had a little burglary here—nothing to speak of—thing I shouldn't have taken much notice of myself." "No, he wouldn't," observed Mrs. Macfadyen, severely. "He didn't even want to call in the police. But, of course, I insisted on that, and Sergeant Pike here thinks he has a clue already." "It seems," answered Mr. Macfadyen, hastening to explain, "that the thief must have climbed on to the study roof just below here, and reached in at the open window. He could easily take anything from the dressing-table like that." "Priscian's watch and chain," said Mrs. Macfadyen, with a precise emphasis, "his signet-ring, and his purse with money in it. And he calls it nothing to speak of!" Something sprang up into Mr. Bowker's throat, turned over, and fell into his chest again. "A—a gold watch?" he managed to say. "His gold watch that cost him fifty guineas at Dent's, and a thick curb chain. And he wasn't even going to call the police!" This was quite terrible. This climb over from the mews and up to the window was just what Mr. Bowker might have done—in pure sport—in his college days; but now! What in the world could have possessed him to behave so? And Sergeant Pike thought he had a clue! "The sergeant says it is obviously somebody who knows the place." observed Mrs. Macfadyen. "That's so much to the good." Mr. Bowker's mouth was drier and stickier than ever. This escapade had probably seemed rather amusing last night; but now! The views of sixty-five are not as the views of twenty-five. This was no "lark." "What I want to know is, how much a burglar would have to take before Priscian would call it serious," was Mrs. Macfadyen's next contribution to the case. "Oh, of course, my dear, I don't say it isn't serious," replied Mr. Macfadyen, with anxious conciliation. "But then it might be much more serious for the burglar if he were caught. We mustn't lose sight of the humanitarian aspect of the case. He may have a starving wife and family. Don't you think so, Bowker?" "Very probable indeed, I should think," assented Mr. Bowker, readily. "In fact, the—the whole case seems to suggest it. And he—he may have only intended it as a joke." "There, you see Mr. Bowker agrees with me," said Mr. Macfadyen. "And as to its being intended as a joke, what could be more likely? The humour of the lower classes is genuine, though crude." "Stuff and nonsense!" replied Mrs. Macfadyen. "The chief difficulty," said Sergeant Pike, "is the umbrella." "The umbrella?" interjected Mr. Bowker, a little puzzled. "Yes," said the detective. "There's an umbrella missing, as well. You didn't put that on the dressing-table, too, did you?" "Certainly not," replied Mr. Macfadyen, with some stiffness. "I assure you I am quite incapable of such an act." "Just so, sir. Nobody'd ever believe such a thing of you, I'm sure. But there's the difficulty. If the thief stood on the study roof and reached in at this window and got the things off the table, how did he get the umbrella out of the hall downstairs? Especially with you sleeping here in the bedroom with the door locked." "That clue," said Mr. Macfadyen, decidedly, "obviously points to a thief of great cunning and resource; and perhaps with so much more obvious and easily-detected crime going on about us, and crying out for attention, it might be as well to waste no more time on this difficult case—at any rate for the present. Um? Eh?" "Why, no, sir. There are other things to consider. There are finger-marks, for instance, on the polished top of this table, and, especially distinct, on the silver backs of the brushes. You see, they're quite clear when you hold 'em up to the light. Now, there's nothing more certain than the finger-print clue. If you'll just look at this clear system of lines, gentlemen, and compare them with any other—your own, for instance—you'll perceive that the difference is quite extraordinary." By some common impulse, both Mr. Bowker and Mr. Macfadyen plunged their hands deep in their pockets at this point, and the sergeant's exposition was interrupted by the appearance of the man Who had admitted Mr. Bowker. "There's a four-wheeler at the door, sir," said the man, "an' the cabman says he wants to see you. He's got your umbrella, and he says he won't give it to anybody but you; and he's as deaf as a post, and I can't make him understand anything!" "I'll go!" said Mr. Macfadyen, making a dash at the door. "So will I!" said Mrs. Macfadyen, with a sudden steely gleam of eye, dashing too. But the cabman was there already, and pushed past the servant. He was such an elderly man as only grows on the box of a four-wheeler, of a species now all but extinct. His face was bristly and crimson, with touches of purple, his voice struggled through the sediment of long-forgotten fogs, and he did not spare it. "Pardon, lady; pardon, gents. I s'pose I was meant to come up, but 'e don't speak loud an' I'm 'ard of 'earin'." He stepped farther into the room, extending a silver-handled umbrella toward Mr. Macfadyen. "I'm a honest man," he announced. "A honest man." "Certainly—thank you—I'm much obliged," said Mr. Macfadyen. But the cabman heard nothing and proceeded. "When I brought you 'ome last night from Pall Mall this 'ere genelman paid the fare—in advance." He pointed with the umbrella at Mr. Bowker. "From Pall Mall!" remarked Mrs. Macfadyen, with the steel in her voice now as well as in her eye. "This is certainly news to me!" "From the club, my dear," explained Mr. Macfadyen. "I—I forgot to mention it, in the excitement of the—ah—burglary!" "The fare was paid in advance," the cabman repeated, "but you didn't remember it, sir, you was that mortal!" "That what?" And even the deaf cabman understood the scandalized prance of Mrs. Macfadyen. "Mortal," he repeated, placidly, a little louder. "'E was that mortal 'e couldn't understand the fare was paid, and as 'e 'adn't got no money 'e made me take his umbrella. Now, I'm a honest man. When I was a-'elpin' 'im with 'is latchkey I might 'a' pinched anythink out o' the 'all, but not me! There ain't many could say that, could they? But I'm a honest man. Anybody might 'a' felt it a dooty to keep the umbrella arter what 'ad 'appened, but not me! I'm a honest man. I don't say but what I've bin an' lost a hour or so this mornin' a-comin' 'ere, an' any gent as was a gent would make it a quid at least, but that's neither 'ere nor there. I'm a honest man, an' I leave it to the genelman 'isself!" There was a horrid pause, and nobody dared look in Mrs. Macfadyen's direction. Mr. Bowker, from behind her, shook his fist and made furious dumb show at the conscientious cabman. "Why, sir," pursued that paragon, surprised at this demonstration, "surely you remember it? You was pretty mortal yourself, but not as mortal as this genelman. You knew summat, you did. Why, when you took care of 'is watch an' chain an' ring an' puss afore you shoved 'im in the cab, I says to meself, 'E knows summat, 'e do,' I says. 'E's bin there afore, many a time,' says I." The man of probity beamed affably on the company as one desirous of promoting cheerfulness. 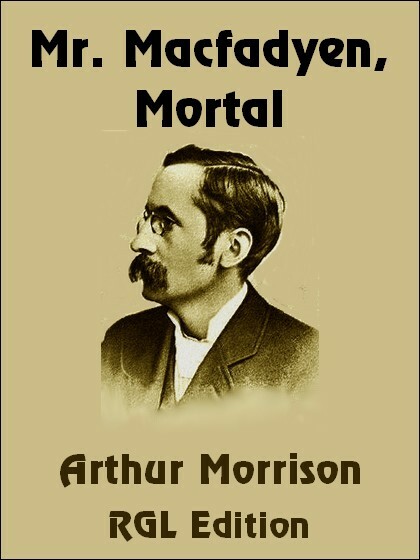 "An' what I say is," he added, "what's the odds if the gent was mortal? 'E ain't the only one, is 'e?" "We are all mortal," faltered Mr. Macfadyen. "You was last night, any'ow!" rapped out the cabman, promptly, with a deaf man's perverse turn of hearing. He grinned and shook his head roguishly, with a wink at Mrs. Macfadyen. "But there, I do like a gent as is open-'anded when 'e's mortal. Why, you'd 'a' give away everythink if the other gent 'adn't collared 'em! You offered yer watch an' chain to the club porter!" Mr. Bowker interposed, rather uncertain of tone, but careful not to speak too loud. "I'm afraid this fellow is far from sober," he said. "It's very sad. It is true, however, that I took care of Mr. Macfadyen's valuables last night for safety. Something had disagreed with him, and he was not at all well." "I'll never touch Welsh rabbit again!" murmured Mr. Macfadyen. "Never!" "Here are the things," Mr. Bowker went on. "In the misunderstanding prevailing I—I felt a certain difficulty in doing so before, as you will understand, Mrs. Macfadyen." Mrs. Macfadyen gathered up the articles with an air that broke the nerve of every male creature present except the cabman. "Yes," she said, "I quite understand, Mr. Bowker, quite. Pray explain no more!" But the cabman viewed this tardy restoration of the valuables with amazement. "What!" he exclaimed. "That's a heye-opener, that is! Seems I've give the game away! Well, I'm blowed! Who'd ha' thought of a bloke like 'im takin' advantage of 'is pal like that! Why, 'e was a-stickin' to 'em if I 'adn't bin a honest man an' come along an' told the truth! Never said a word, 'e didn't, not till I'd told the gent who'd 'ad 'is watch! That's a corker, that is! Well, well! It seems I've got back all them things for you, as well as the umbrella. As a honest man I ought to 'ave two quid at least!" Mr. Bowker strode back to his rooms with darkling brow. "Wade!" he thundered, "come here!" "Yes, sir!" responded Wade, appearing from the next room with his semi-impudent grin in no whit abated. "Wade, I believe you're under notice to leave my service?" "I was, sir," smirked Wade, "but under the circumstances—"
"In the circumstances, Wade, you're an insolent scoundrel. There's your month's money. Go this instant!"